There are many ways in which you can and should use your business card for prospecting. Which is why it’s absolutely critical that you learn to always have a supply of business cards on your person or close at hand. Equally as important is the means to store and administer the business cards you receive in turn. A fundamental method of distributing your business cards is to include one in every form of correspondence – whether it’s a letter, invoice or statement. It doesn’t matter that it goes to an existing client who already knows what you do and what your contact details are … every card of yours that they have is a potential point of distribution. They might pass it on to others in their organization or to someone they know who could use your services. This is also a way of announcing new products or services, in which case it might pay to have a separate business card designed. Cross promote with allied businesses. 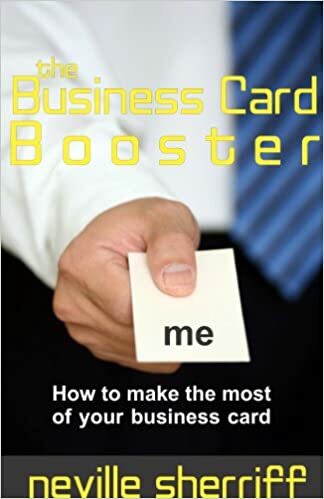 A plumber, for instance, can tie up with an interior decorator with each handing out the other’s cards to their clients and prospects, or including a card in their correspondence. Write something like “Referred by Pete the Plumber” on the back so your “partner” can tell where the contact came from. Consider even the most mundane interaction an opportunity to hand out your business card. Give one to the person you rent something from, at the dentist or doctor, the car repair service, the doggie parlour who just cleaned up your mutt. Use the back of your card to write down a special offer or a web address where a special report can be downloaded. You can also add this information by adhering a printed sticker. Ask a potential prospect for their business card … chances are they’ll ask for yours in return. Attach your business card to the handle of your briefcase, so that it looks like a name tag. It might open up a conversation with a fellow passenger. Mail your card after meeting the prospect and asking for their business card – say your own cards are still with the printer. Include a follow-up note in your mail piece.